by Chris Woodford. Last updated: March 1, 2019. Stonehenge in England, the Great Pyramid of Giza, the Peruvian citadel at Machu Picchu—three wondrous examples of how stone structures can last hundreds or even thousands of years. But though stone is one of the oldest and most durable building materials, it isn't exactly easy to work with. It's heavy, hard to transport, and usually comes in giant chunks, which have to be laboriously cut to shape. Wouldn't it be great if there were a recipe for stone—a kind of gooey cake mixture we could throw together wherever it was needed, simply pressing it into molds to make buildings and structures of any shape or size? Well that kind of "liquid stone" really does exist: we call it concrete. Although it sometimes gets a bad press, because many people associate it with brutal urban architecture from the mid-20th century, concrete is the great, unsung hero of the modern, material world. From the Hoover Dam to the Sydney Opera House, you'll find it in the world's tallest skyscrapers, biggest bridges, longest highways, deepest tunnels, and quite probably even under the floor in your own humble little home. Concrete is pretty amazing stuff, but what is it and how exactly does it work? Let's take a closer look! Photo: Reinforced concrete is the power behind virtually every modern building and major structure. This is one of the static reinforced concrete arches in the Umpqua River Bridge, a 1930s swing bridge carrying Oregon Coast Highway in Douglas, Oregon. Photo by Jet Lowe/Historic American Engineering Record courtesy of US Library of Congress. 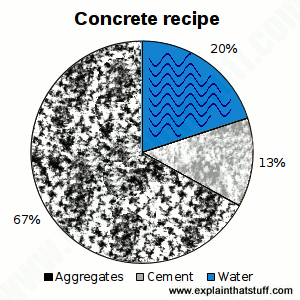 Chart: Concrete recipe: The ingredients of a typical mix. Thrown together and mixed well, these simple ingredients make a composite, which is the name we give to a hybrid material that's better in some important way than the materials from which it's made. In the case of concrete, the "important" thing is that it's strong, hard, and durable. Thinking of concrete as a composite material, the cement hydrate is the background, binding material (technically called the "matrix") to which the sand and gravel add extra strength (the "reinforcement"). 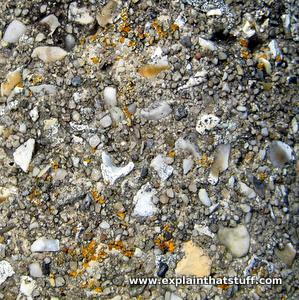 Photo: Concrete composite: Look closely at this concrete and you can clearly see how it's working: the lighter colored aggregate (stones of various shapes and sizes, which acts as the reinforcement) is bound together by the darker colored cement (the matrix). Not all concrete looks as rough as this, however; I had to look around quite hard to find this example in a concrete post near my home. How does concrete form from ingredients that are nothing like the final product? When you add water to cement, crystals of cement hydrate (technically, calcium-silica-hydrate) start to grow, which lock the sand and gravel tightly together. It's this gradual crystal formation that gives concrete its strength, rather than the simple fact that it's drying out. Indeed, the reason you have to keep wetting concrete for several days, as it sets, is to "power" the chemical reactions that hydrate the cement. The mushy slushy mixture that tumbles from your concrete mixer gradually turns much harder than the materials from which it's formed. "Liquid stone" becomes stone for real—well, artificial stone, at least. And by "gradually," I really do mean gradually: concrete hardens in hours, gets properly hard after about a month, but continues to harden and strengthen for at least five years after that. An interesting fact, from recent scientific studies of concrete, is that the "crystals" inside it aren't really crystals at all: they're not well-ordered and perfectly regular, as crystals are supposed to be, but actually have some of the random structure you find in materials like glass (scientifically known as amorphous solids). Concrete contains quite a bit of trapped air (as much as 5–10 percent), because there is some space around the open, three-dimensional structure of cement hydrate crystals and the sand and gravel trapped between them. And that, in turn, explains why concrete can bend and flex, stretch and compress (just a little bit, anyway). Just like any recipe, you can vary the mixture for concrete somewhat (more water, perhaps, more aggregates, or even chemicals of different kinds) to produce concrete that flows faster, sets harder or more quickly, weathers better, or has a particular color or appearance. Adding a pigment called titanium dioxide, for example, is a simple way of making concrete bright and white—a million miles from the drab gray stuff that gives concrete car parks a bad name. Another variant is aerated concrete, which looks a bit like a very hard sponge with masses of tiny air pockets inside. These allow the concrete to expand and contract in hot and cold weather without fatally cracking and also make it an excellent heat insulating material. Photo: When concrete is sprayed from a hose at high-speed, instead of slowly laid from a concrete mixer, it's called shotcrete. Here you can see a thin layer of shotcrete covering up a steel grid of reinforcing bars (rebar). Picture by David Parsons courtesy of US Department of Energy/National Renewable Energy Laboratory (US DOE/NREL). Why is concrete such a popular building material? In cities, at least, concrete is everywhere you look—and it's not hard to understand why. It's easy to make from cheap and readily available ingredients, easy to pour into molds and make into all kinds of shapes (because it starts life a very viscous liquid), and it's both fireproof and (relatively) waterproof. But the main reason it's so widely used in buildings is that it's extremely strong in compression: you can squeeze it or stand a great deal of weight on it. It's widely used in walls and foundations (the vertical supports, in other words) because it's great for resisting weight piled on top. Unfortunately, concrete's very big drawback is that it's about 10 times weaker in tension than in compression. It cracks or snaps easily if you bend or stretch it, unless you reinforce it with steel inside, so it's not much use in horizontal beams. Although concrete looks heavy and monolithic, it's actually much lighter than you might suppose: it's about a fifth as dense as lead, a third as dense as steel, 10 percent less dense than aluminum, and only fractionally more dense than glass. Although concrete is often mixed on-site and formed into whatever shapes are needed at the time, it can also be supplied in precast "modules"; blocks, beams, wall sections, pavements, and cladding can all be made this way. Giant, modern segmental bridges, for example, are often quickly and inexpensively assembled from identical concrete sections that have been precast in a factory and shipped to their final location. That makes them quicker and easier to construct than if the entire bridge had to be cast in-situ, which is much harder to do in the middle of a river, for example, or in adverse weather conditions. Another option is to make concrete structures that combine some precast sections with other sections formed on-site. Artwork: Concrete ideas: Thomas Edison immediately understood the brilliance of concrete as a material for making "instant" buildings. In the early years of the 20th century, he devised this method for making "single-pour" concrete houses that could be mass-produced inexpensively in very large quantities. 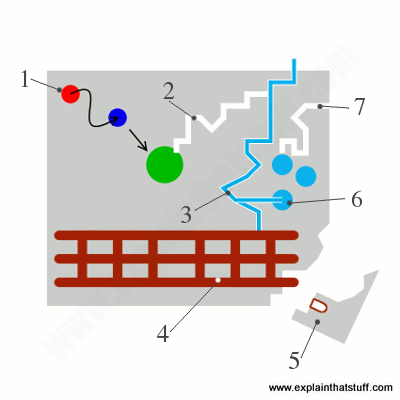 Concrete, from a pair of mixers (blue), is fed to a tank (red), agitated (green), and then carried by an auger screw (orange) to the top of a huge, three-dimensional mold. Poured through the mold, it forms the walls, floors, and roof of the building—and even some of the fittings (like bathtubs) inside! Unfortunately, the idea never caught on. 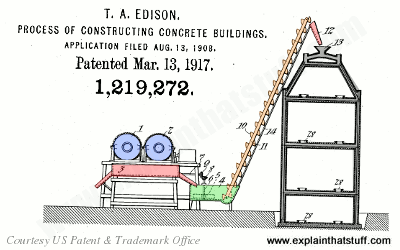 Artwork from US Patent 1,219,272: Process of constructing concrete buildings by Thomas Edison, March 13, 1917, courtesy of US Patent and Trademark Office. As we've already seen, concrete is a composite material—a cement matrix with aggregates for reinforcement—that works well in compression, but not in tension. We can solve that problem by casting wet concrete around strong, steel reinforcing bars (tied together to make a cage). 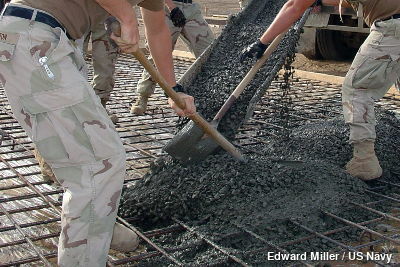 When the concrete sets and hardens around the bars, we get a new composite material, reinforced concrete (also called reinforced cement concrete or RCC), that works well in either tension or compression: the concrete resists squeezing (provides the compressive strength), while the steel resists bending and stretching (provides the tensile strength). In effect, reinforced concrete is using one composite material inside another: concrete becomes the matrix while steel bars or wires provide the reinforcement. The steel bars (known as rebar, short for reinforcing bar) are typically made from twisted strands with nobbles or ridges on them that anchor them firmly inside the concrete without any risk of slipping around inside it. Theoretically, we could use all kinds of materials to reinforce concrete. Generally, we use steel because it expands and contracts in the heat and cold roughly as much as concrete itself, which means it won't crack the concrete that surrounds it as another material might if it expanded more or less. Sometimes other materials are used, however, including various kinds of plastics. Photo: "Liquid stone" to go—pouring concrete from a mixing truck. These construction workers from the US Navy are spreading wet concrete from a truck onto rebar (a grid of steel reinforcing bars). When the concrete sets, the steel bars will give it added strength: concrete plus steel equals reinforced concrete. Picture by Lt. Edward Miller, courtesy of US Navy. Although reinforced concrete is generally a better construction material than the ordinary stuff, it's still brittle and liable to crack: in tension, reinforced concrete can fail in spite of its steel reinforcement, letting water in, which then causes the concrete to fail and the rebar to rust. The solution is to put reinforced concrete permanently into compression by prestressing it (also called pretensioning). So instead of putting steel bars into wet concrete as they are, we tension (pull on) them first. As the concrete sets, the taut bars pull inward, compressing the concrete and making it stronger. Alternatively, rebars in reinforced concrete can be stressed after it starts to harden, which is known as poststressing (posttensioning). Either way, keeping concrete in compression is a cunning trick that helps to stop it cracking (and stops cracks from spreading if they do form). Another advantage is that it's possible to use less prestressed or poststressed concrete or smaller, more slender pieces to carry the same loads, compared to ordinary, reinforced concrete. Cracks are the last thing you want to see in a building or bridge, especially a relatively new one made from concrete. But if we've got concrete structures dating back to Roman times, how come some of the concrete bridges, skyscrapers, and other structures built just a few decades ago, in the late 20th century, are already falling apart? There are several explanations. Older, Roman-type, pozzolanic concrete, made from volcanic ash, tends to crack less than more modern forms of concrete, and it was used mainly in compression, so even if cracks had the opportunity to form, they were less likely to spread. Reinforced concrete is more likely to be used in tension, which is why it has those steel reinforcing "rebars" inside. But, as we've already seen, it can still crack unless it's prestressed. Modern concrete fails through what's informally known as concrete cancer or concrete disease, which involves three interrelated problems. First, alkalis from the cement react with silica in the aggregates from which the concrete is made. This makes new crystals grow very slowly inside the concrete, which take up more room than the original "crystals," so making the concrete crack apart from the inside out or flake away ("spall") from the surface, letting in water from outside. On something like a highway bridge, any water that gets in might also be alkaline because of the salts used to treat the road in winter. The second problem is that the water that gets in will eventually come into contact with the steel reinforcing bars inside, causing them to rust and decay, possibly expanding so they cause fatal weaknesses in the structure. The dirty brown stains you see on concrete with "cancer" are often caused by rusty water draining through the cracks. A third issue is that water that has seeped inside concrete through cracks can freeze in winter, which means it will expand and cause further cracks through which even more water will penetrate, causing a vicious circle of degeneration and decay. Artwork: How reinforced concrete fails: (1) Alkalis from the cement react with silicas in the aggregates, forming larger crystals that crack the concrete apart from the inside, (2). Water flows in down the cracks (3), rusting the rebar (4), which can break apart and cause more cracking or "spalling" at the edges (5). In cold weather, water trapped inside cracks will expand as it freezes (6), causing new cracks to appear (7). The cracks aren't necessarily large: some are very thin capillaries, which means water can move up them by simple capillary action as well as draining down through them due to gravity. Growing concerns about the environment, and climate change in particular, have highlighted another major problem with concrete: after transportation and energy, cement production is the third biggest source of carbon dioxide emissions. That's partly because the process of making cement releases a lot of carbon dioxide but also, very importantly, because of the enormous amount of cement and concrete used worldwide. The carbon dioxide is released in two quite different ways (split roughly half and half between them): first, because of the fossil-fuel energy used during the manufacture of cement; second, because cement is produced when calcium carbonate turns to calcium oxide, releasing carbon dioxide in the process. Concrete relies on cement, so it's anything but a sustainable material, which worries architects, in particular, because they tend to be very environmentally conscious. 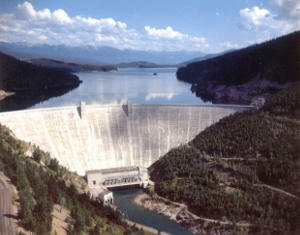 Photo: An early example of greener concrete from 1953: Hungry Horse Dam on the Flathead River, Montana, USA, was built using 120,000 metric tons of recycled fly ash from incinerators. Picture courtesy of US Bureau of Reclamation. Since carbon dioxide is released in two ways during cement production, it follows that there are two ways of making more environmentally friendly concrete. Historically, since the Industrial Revolution, much of humankind's energy has come from burning coal, which releases more greenhouse gases than other fuels, and traditionally cement kilns were coal-fired too. Switching them from coal to natural gas is one solution, since gas releases less carbon dioxide for a given amount of energy. Making cement kilns more efficient reduces the total energy they need, which also reduces their carbon dioxide emissions. The other solution is to reduce the amount of cement in the concrete mixture by using recycled materials, such as fly ash from incinerators. Another exciting prospect is the development of concrete that doesn't use calcium carbonate at all. Instead, the carbonate is made by bubbling carbon dioxide from a power plant through seawater. This has an overall environmental benefit, since it takes the harmful waste CO2 emissions from power plants and turns them into very useful concrete instead. It's a kind of carbon capture and storage (CCS). Another environmental drawback of concrete comes from its use of aggregates, which have to be quarried, often from environmentally sensitive areas such as river valleys. Using recycled aggregates (including recycled concrete from old demolished buildings) is a possible solution here. ~7000 BCE: A Neolithic settlement at Yiftahel in Galilee, Israel has a crude "concrete" floor made using burnt lime plaster. ~5600BCE: A concrete-like material is used in the floors of Mesolithic (Middle Stone Age) Serbian dwellings at Lepenski Vir, in Serbia, on the banks of the Danube River. ~3000BCE: Egyptians use crude forms of cement and concrete in the pyramids. ~200BCE: Romans use a type of concrete called pozzolana (sometimes referred to as pozzolanic cement), based on volcanic ash sourced from Pozzuoli, Naples. It's used in iconic Roman structures such as the Colosseum and Pantheon in Rome. 400AD–~1750CE: Effectively, the concrete Dark Ages: knowledge of concrete is entirely lost after the fall of the Roman Empire. 1750s: John Smeaton, an English engineer, rediscovers the art of making "hydraulic" cement (that hardens with water) using Blue Lias stone, clay, and pozzolana, originally for the Eddystone lighthouse off Plymouth, England. 1824: Englishman Joseph Aspidin develops Portland cement, which resembles a natural stone extracted from Portland in Dorset, England. Portland cement is destined to become the key ingredient in concrete. 1832–1834: William Ranger patents precast concrete. 1867: Frenchman Joseph Monier patents reinforced concrete for use in garden flower pots, showing them off at the Paris Exposition the same year. ~1850s: French builder François Coignet begins widespread use of concrete in buildings, including the first iron-reinforced house in Paris, France. 1884: English-born, American-based architect Ernest Leslie Ransome patents twisted rebars, which give better grip inside concrete, so making it stronger. 1870: Frenchman François Hennebique develops an efficient new process for constructing buildings with reinforced concrete, leading to its widespread uptake. 1880s: Prestressed concrete is invented in Germany, though not commercially developed. Photo: A memorable modern use of reinforced concrete. 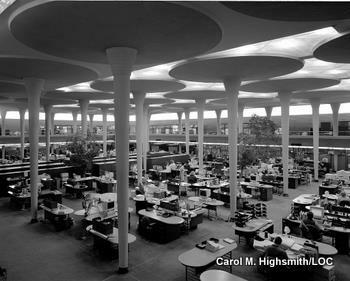 This is the famous Great Workroom of architect Frank Lloyd Wright's Johnson Wax Headquarters in Racine, Wisconsin. The roof is supported by astonishingly slender reinforced concrete columns that taper down from 5.5m (18ft) at the top to just 23cm (9in) at the bottom. According to Jonathan Lipman's book about the building, Wright got the idea after seeing a waiter carrying a tray on his arm. Picture courtesy of the Carol M. Highsmith Archive, Library of Congress, Prints and Photographs Division. 1891: The first street in the United States with a concrete pavement is laid at Bellefontaine, Ohio. A section of it remains in place to this day. 1917: Thomas Edison, prolific American inventor, patents an idea for a mass-produced concrete house, but the idea fails to catch on. 1913: The first load of ready-mixed concrete is delivered by truck to a site in Baltimore, Maryland. 1915: Colored concrete is invented by Chicago-based engineer Lynn Mason Scofield. 1920s: Frenchman Eugene Freysinnet turns prestressed concrete into a commercially successful building material. 1936: Concrete is used to complete the mighty Hoover dam, the biggest concrete structure ever attempted up to that point. 1956-1959: American architect Frank Lloyd Wright builds the iconic Guggenheim Museum, in New York City, from concrete. 1962: Finnish architect Eero Sarinen constructs the famously bird-like concrete roof of the Trans World Airlines (TWA) Flight Center at New York's John F. Kennedy International Airport. Three years later, he designs New York City's iconic concrete skyscraper, the CBS Building. 1970s: Reinforced concrete based on plastic fibers is invented. Reinforced Concrete: Mechanics, Theory, and Design by James K. Wight and James Grierson MacGregor. Prentice-Hall, 2011. A textbook for university engineering students. Reinforced Concrete: A Fundamental Approach by Edward G. Nawy. Prentice-Hall, 2009. A detailed guide for engineers. Eero Saarinen: Shaping the Future by Eero Saarinen et al. Yale University Press, 2006. A photo guide to structures and buildings by one of the pioneers of 20th-century reinforced concrete architecture. Concrete Architecture by Catherine Croft. Gibbs Smith, 2004. A coffee-table "celebration of concrete," including a history of the material and a photo guide to iconic concrete buildings and structures. Concrete Architecture: Tone, Texture, Form by David Bennett. Birkhäuser, 2001. A detailed review of 25 notable concrete structures, with an emphasis on more recent projects. Guardian Concrete Week: A fascinating collection of articles about the environmental and social challenges of living in a world made of concrete. The battle to curb our appetite for concrete by Tim Bowler. BBC News, October 24, 2018. What's the real environmental impact of concrete—and how can we reduce it? Scientists explain ancient Rome's long-lasting concrete by Matt McGrath. BBC News, July 4, 2017. The mineral aluminum tobermorite seems to have made Roman concrete more durable than our modern equivalent. Experts Propose Research Priorities for Making Concrete 'Greener': NIST Tech Beat, April 3, 2013. How can we reduce the carbon dioxide emissions of concrete making? Age-Old Recipe for Concrete Is Water, Cement, Sand, and Rocks by Susan Hassler. IEEE Spectrum, 18 July 2011. Can engineers develop a more environmentally friendly concrete? Concrete Alternative Could Make For Stronger Buildings by Alexander George. Wired, 12 August 2011. Prompted by the devastating earthquake of 2011, Japanese engineers have developed a strong new building material called CO2 structure. 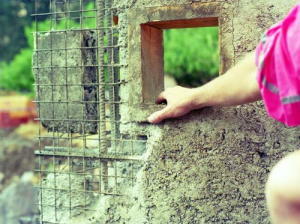 Scientists develop eco-concrete from rice husks: BBC News, 13 April 2010. Explores a new type of eco-friendly concrete that produces fewer carbon dioxide emissions during manufacture. Who's responsible for all the concrete carbuncles? : BBC News, 19 February 2009. Architect "Le Corbusier" favored concrete buildings; in this article, Guy Booth considers whether we should love or loathe his work. Scanner to 'see inside' concrete: BBC News, 25 October 2005. How do you locate signs of corrosion deep inside giant concrete structures?